The Friends of Howland Preserve 501(c)(3) non-profit organization works in partnership with the North Branch Land Trust to preserve the natural beauty, historical structures, and conservation value of the Howland Preserve and maintain the property for the benefit of the public. Join the Volunteer Movement! Join our Newsletter! Tucked away in the countryside along the Susquehanna River just north of Tunkhannock is a 669-acre property with historic buildings from the 1700 and 1800's, a canal bed, a rail bed, a graveyard also dating back t0 the 1700s, stone walls, non-motorized boat access, picnic areas, a planned trail system and more. Although open daily to the public from dawn to dusk, The Howland Preserve, 546 Vosburg Road, Tunkhannock, remains something of an unintended secret to the majority of the community — which the Friends of The Howland Preserve is attempting to change. In addition to Howland Preserve's monetary needs, the we are always seeking volunteers from the community to help with a variety of tasks, such as trail building, grounds maintenance and monitoring, skilled labor on the buildings and more. 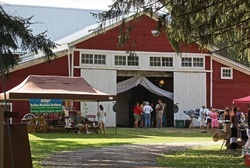 The property was donated to North Branch Land Trust by the late Ernest E. Howland in 2006. With a growing need for volunteer assistance, the Friends of Howland Preserve was created in 2013 to support The North Branch Land Trust's mission and maintain, grow and love their magical property. Come visit, and you will see why we are so mesmerized by this place.